In my last post, I explained several reasons why I prefer logistic regression over a linear probability model estimated by ordinary least squares, despite the fact that linear regression is often an excellent approximation and is more easily interpreted by many researchers. I addressed the issue of interpretability by arguing that odds ratios are, in fact, reasonably interpretable. But even if you hate odds ratios, you can still get estimates from a logistic regression that have a probability interpretation. In this post, I show how easy it is to do just that using the margins command in Stata. (It’s even easier with the SPost13 package for Stata by Long & Freese). The i. in front of black and female tells Stata to treat these as categorical (factor) variables. Ordinarily, this wouldn’t be necessary for binary predictors. 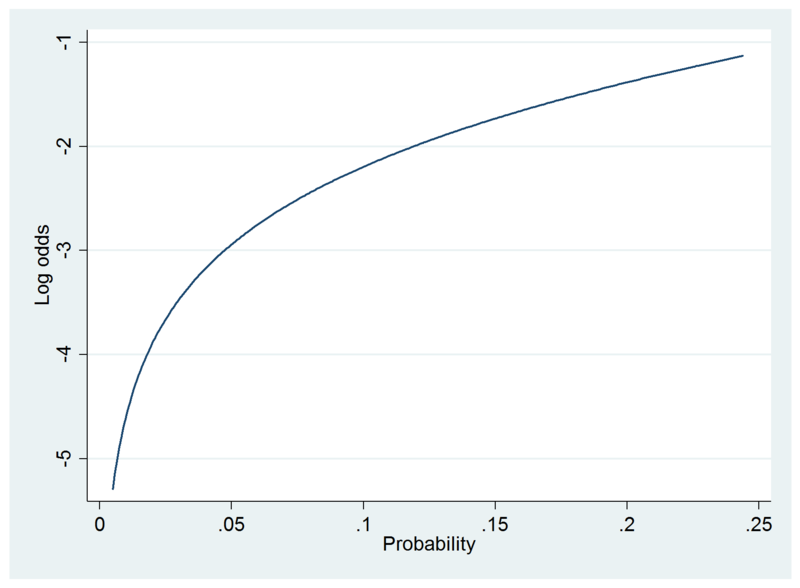 But it’s important for getting Stata to calculate marginal effects in an optimal way. A typical interpretation would be to say that the odds of diabetes is twice as large for blacks as for non-blacks, an “effect” that is highly significant. Females have a 17% higher odds of diabetes than males, but that’s not statistically significant. Finally, each additional year of age is associated with a 6% increase in the odds of diabetes, a highly significant effect. The dy/dx column gives the estimated change in the probability of diabetes for a 1-unit increase in each predictor. So, for example, the predicted probability of diabetes for blacks is .04 higher than for non-blacks, on average. How is this calculated? For each individual, the predicted probability is calculated in the usual way for logistic regression, but under two different conditions: black=1 and black=0. All other predictor variables are held at their observed values for that person. For each person, the difference between those two probabilities is calculated, and then averaged over all persons. For a quantitative variable like age, the calculation of the AME is a little more complicated. There’s another, more traditional, way to get marginal effects: for the variable black, hold the other two predictors at their means. Then calculate the difference between the predicted probabilities when black=1 and when black=0. This is called the Marginal Effect at the Means (MEM). Note that calculation of the MEM requires only the model estimates, while the AME requires operating on the individual observations. Here the MEM for black is noticeably smaller than the AME for black. This is a consequence of the inherent non-linearity of the model, specifically, the fact that averaging on the probability scale (the AME) does not generally produce the same results as averaging on the logit scale (the MEM). The non-linearity of the logistic model suggests that we should ideally be looking at marginal effects under different conditions. Williams (and others) refers to this as Marginal Effects at Representative Values. We see that the AME of black at age 20 is quite small (.006) but becomes rather large (.070) by age 65. This should not be thought of as an interaction, however, because the model says that the effect on the log-odds (logit) is the same at all ages. I’ve requested robust standard errors to deal with any heteroskedasticity, but the t-statistics are about the same even without this option. The t-statistics here are pretty close to the z-statistics for the logistic regression, and the coefficients themselves are quite similar to the AMEs shown above. But this model will not allow you to see how the effect of black on the probability of diabetes differs by age. For that, you’d have to explicitly build the interaction of those variables into the model, as I did in my previous post. The upshot is that combining logistic regression with the margins command gives you the best of both worlds. You get a model that is likely to be a more accurate description of the world than a linear regression model. It will always produce predicted probabilities within the allowable range, and its parameters will tend to be more stable over varying conditions. 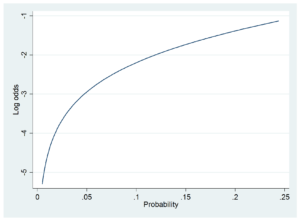 On the other hand, you can also get numerical estimates that are interpretable as probabilities. And you can see how those probability-based estimates vary under different conditions.